Finish: Translucent Dark Azure Blue Glass Accented with Crystal details. 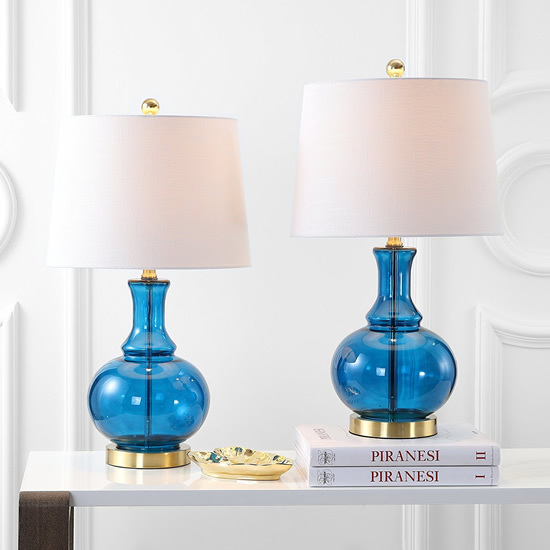 Translucent Dark Azure Blue Glass Accented with Crystal details. 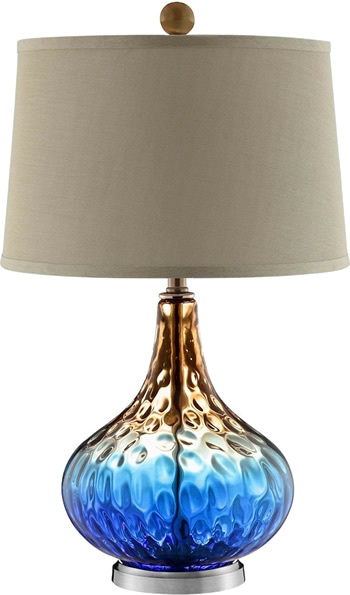 Crudely Grooved Frosted Blue Glass with Polished Nickel Plated Accents and Crystal details. The Round Hardback Drum Shade is a Crisp Off-white Linen Fabric. 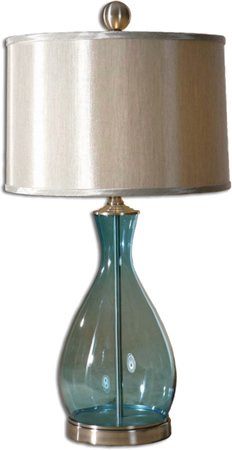 Finish: Crudely Grooved Frosted Blue Glass with Polished Nickel Plated Accents and Crystal details. 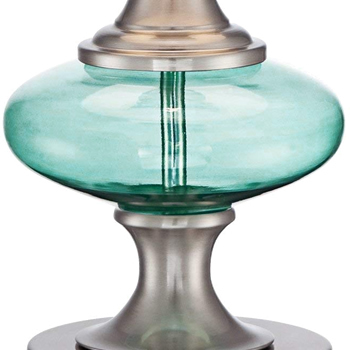 Crudely Grooved Frosted Blue Glass with Polished Nickel Plated Accents and Crystal details. 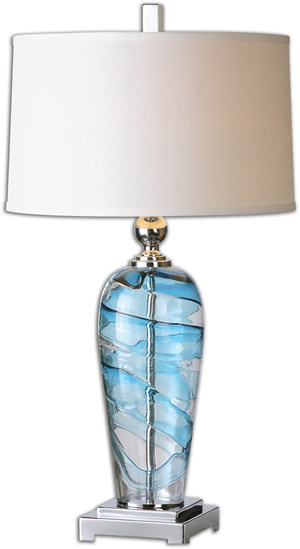 Finish: Blown, Clear and Blue Glass Accented with Polished Nickel Plated details. 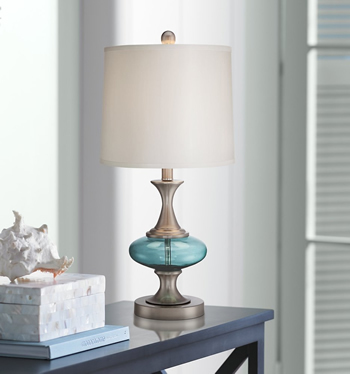 Blown, Clear and Blue Glass Accented with Polished Nickel Plated details. 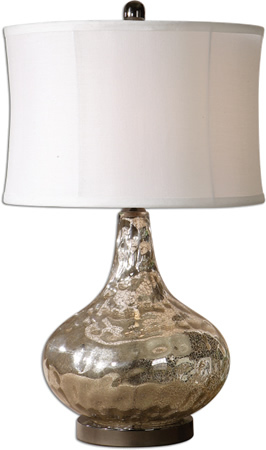 1 x 100 watt max standard base bulb (not included). 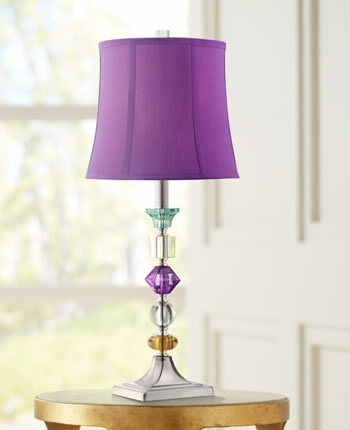 This lamp is NOT glass. 9" at the top x 11" at the bottom x 10" high. 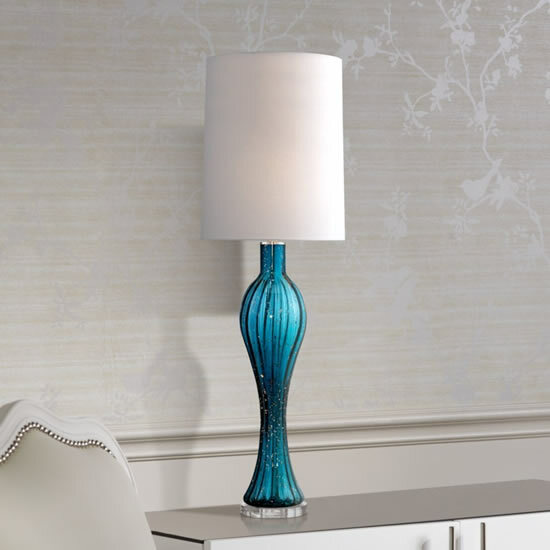 The tapered jug style base of this transitional table lamp features a top section of clear cobalt blue glass with the stand visible inside. 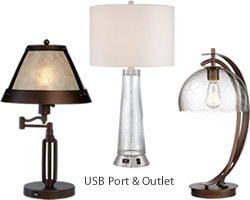 The round metal bottom section is finished in antique brass that is repeated on the metal drum shade. With a distinctive cut-out pattern of stair-like cubes, the chic shade allows light to pass through and glisten elegantly into the room. 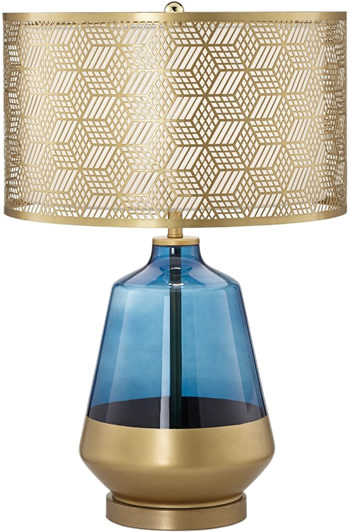 Rich with hues ranging from warm gold to luminous cobalt blue, this colored glass table lamp is remarkable. A camel colored silk hardback shade completes its distinctive look. 12" across the top x 13" across the bottom x 16" on the slant. 1 x 150 watt max standard bulb (not included). 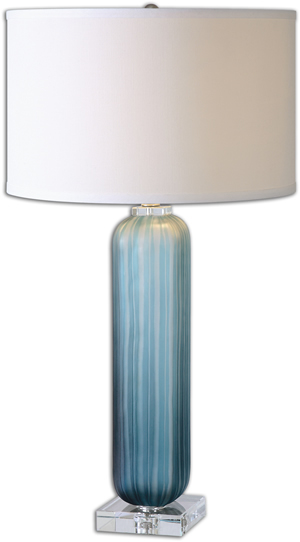 Elegantly fluted tall table lamp with a vibrant blue art glass body topped by a white drum shade. 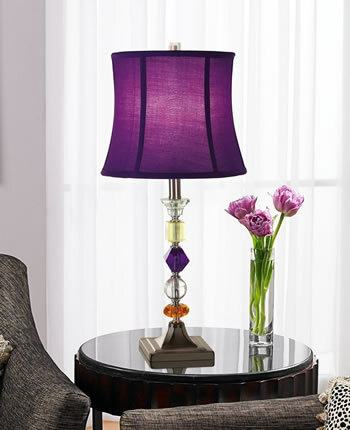 The lamp base is clear acrylic. 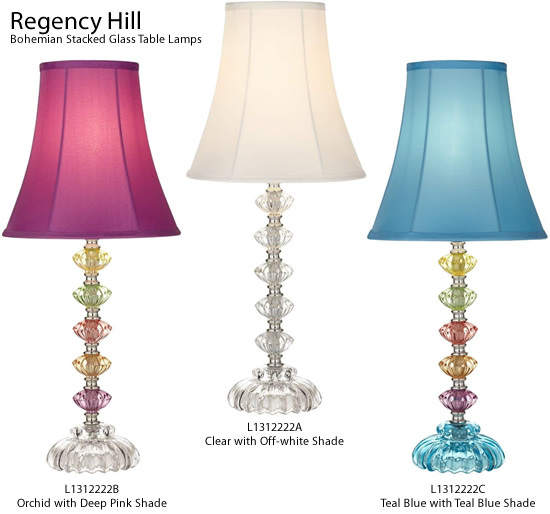 Regency Hill Bohemian Stacked Glass Table Lamps have a clear or multi-colored glass stacked column topped with a fabric bell shade. 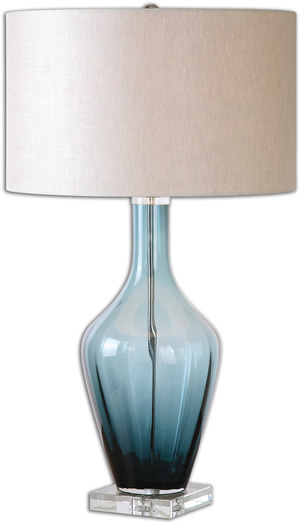 This lamp offers a clear blue, mouth blown glass body with satin nickel metal detail and a silken silver/gray hardback shade. 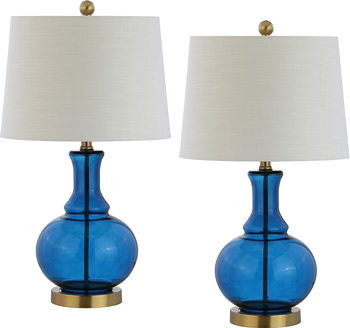 Finish: Clear Blue, Mouth Blown Glass Body with Satin Nickel Metal Detail. Finish: Nickel Plated Water Glass with Polished Nickel Plated metal details. 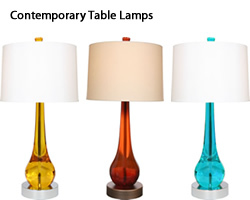 Shade: 12" x 19" x 13"
Table Lamp of hand-blown color infused glass within iron base. Hand-tailored shade of spun gold silk features decorative pleated gallery. -1 Warm Silver Leaf finish. 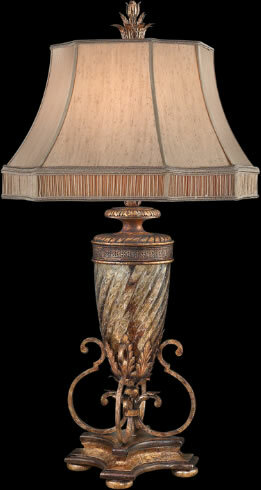 Finish: Water Glass Base with Heavily antiqued Gold Details. Water glass finished on the inside with a lightly antiqued, crackled, polished chrome with Black nickel details. The round modified drum shade is a white linen fabric. Finish: Water Glass Finished On the Inside with a Lightly antiqued, Crackled, Polished Chrome with Black Nickel Details. Dimensions: 14" x 25" x 14"
Classic curves accentuate hand-blown glass in this perfect combination of classic and contemporary. 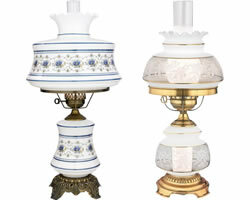 In an eye-catching blue glass and brass base, rod, and finial, no design detail was overlooked. 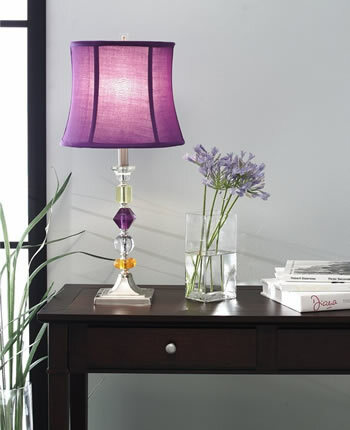 Softened with a white linen drum shade and finished with a silk-wrapped cord, the style extends all the way to the plug.